The hubris and arrogance of the far right fringe knows no bounds. More than 100 Christian leaders from a wide range of theological and political backgrounds signed the covenant. However, Dr. George O. 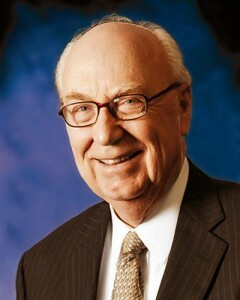 Wood, (pictured) general superintendent of the Assemblies of God, asked that his name be removed from “A Covenant for Civility,” which was released in March. “I do not want my name or the Assemblies of God to be associated with persons who claim to be in the Body of Christ yet reject the moral teachings of Scripture,” Wood told freelance writer and conservative Christian blogger John Lanagan. Apparently, Wood was under the impression that the document would be committed to “by fellow evangelicals.” He was angered because some of the signatories included Brian McLaren, author of A New Kind of Christianity; Lillian Daniel, senior minister of a First Congregational Church which is pro-gay; and Dr. Ken Brooker Langston, director of Disciples Justice Action Network which is pro-choice. Isn’t the point of a Covenant for Civility to treat those with whom we disagree with dignity and respect? What is the point of creating such a document for people who are already on the same page? The self-serving and self-righteous message sent by wood is unmistakable: If you agree with me and come into our shrinking tent we love you. If you are not with us, you are against us and the gloves are off. What a wonderful message for the head of this “family values” denomination to send to impressionable children. Play the game my way or I’ll take my toys (and your toys) and go home!